It is possible to convert a bulk number of Lotus Notes DXL emails to NSF file format. This tool facilitates its users to collectively export all the DXL files to Lotus Notes NSF database file. But it is important to have Lotus Notes installed on their machine. 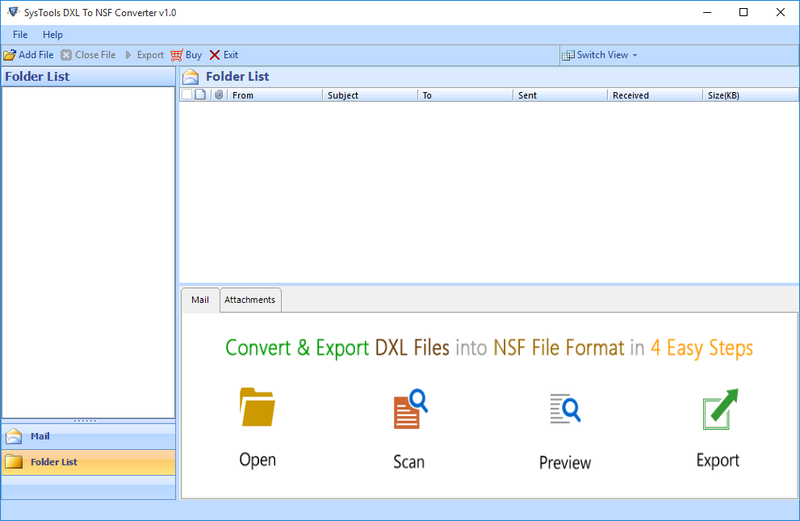 Once the file or folder is loaded in DXL file to NSF Converter, users need to click on the Export button. A Mail Filter option will be displayed. One can apply this filter in order to get DXL emails in NSF file of specific duration. TThe DXL file to NSF Converter tool is built with the capability of thoroughly processing source file(s) and fetching data from it. This previewing facility enables users to assure that all the migrated data is perfectly moved or not. You can preview emails along with attachments. 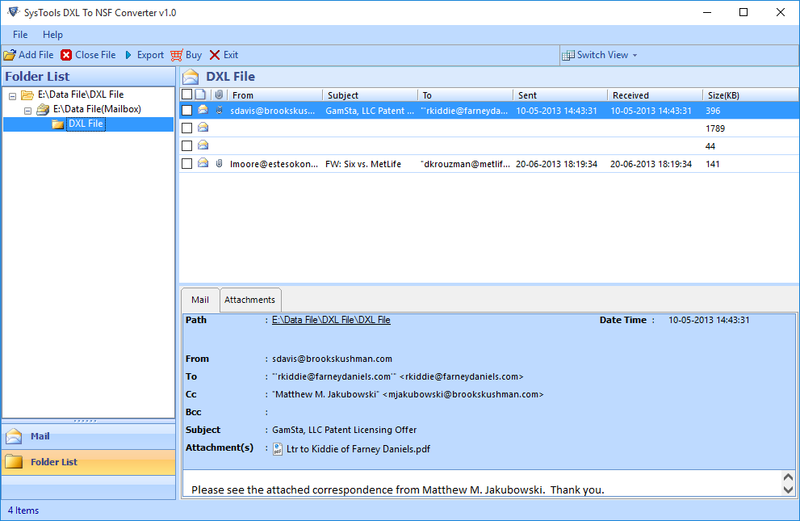 Users can perform selective email conversion of DXL to NSF file format. After all the emails get loaded on preview pane, one just needs to select the desired email and right-click on it to import DXL emails to NSF database file selectively. Add File To add DXL files one by one for the conversion of data items to NSF file. 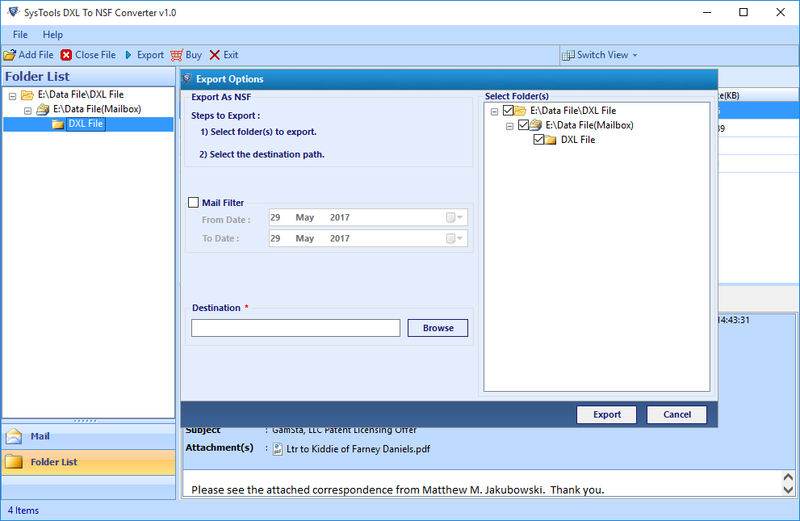 Add Folder: You can add complete folder having a bulk number of DXL files to perform the bulk migration. One can import DXL emails to Lotus Notes NSF database file without data loss. The DXL to NSF Converter software guarantees that not even a single bit data will be harmed while performing the conversion process. In the output, tool maintains the properties of an email message like To, received data, subject, etc. It remains intact and safe. In comparison to Lotus Notes NSF file, DXL is less popular among users. IBM Domino server clients find this file as database storage of some another email client. Therefore, they look for a solution by which they can convert DXL file to NSF format. Apart from this, conversion from DXL file to NSF format can also acts a means for IBM Notes backup file. The software proves itself to be worthy when users want to import DXL file to NSF. No matter what is the size of the .dxl file, one is free to browse the file of any size without any hurdles. 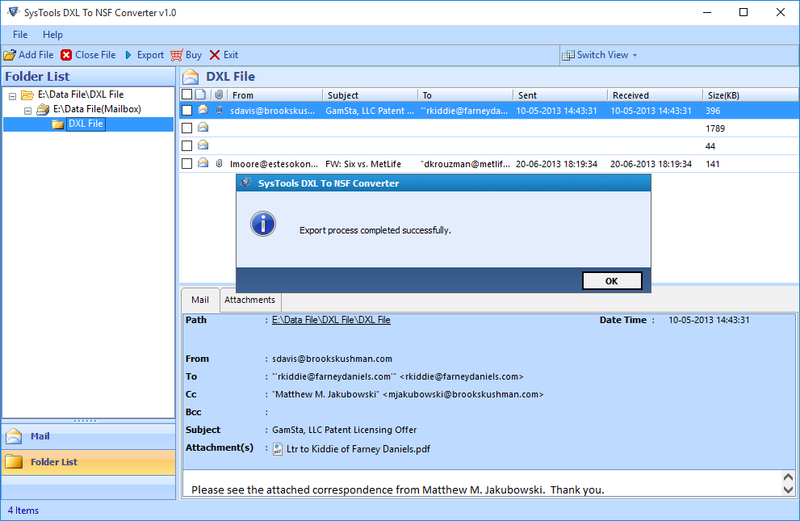 The tool offers an ultimate feature of converting DXL files to NSF in bulk. To have a speedy bulk conversion, users can collectively save all the Domino DXL files in one folder and then, directly browse this folder on the software panel. Talking about the interface of the software then, the Graphical User Interface of the product is designed in such a way that even a novice user can access this tool. It does not require any technical guidance to work with it. One needs to have Lotus Notes installed on their machine to have a successful migration experience with our software. Installation of Lotus Notes 9.0 or below version is required & it should be Offline/not connected with Domino server. For Window 10/8.1/8/7 or Vista users, then launch the tool as "Run as Administrator". Step 1: Install and run DXL to NSF Converter tool. Step 2: Click on Add File to select the DXL file. Step 3: Now, you can add DXL files by two modes: Add File & Add Folder. Step 4: After adding the file, you can view all the contents in right panel of the window. Step 5: Now, you can perform selective or bulk conversion of data by applying filters. Step 6: Browse the destination location to save the NSF file. Step 7: After complete export process, you can navigate to the destination location and view the NSF file. Will I be able to operate this tool on Windows 10 without having Lotus Notes configured on my machine? Our DXL to NSF Converter software will smoothly get installed on Windows 10 operating system because it is compatible with all the versions of Windows OS. However, the product demands a Lotus Notes platform (even in offline mode) for its proper working. Is there any need to have Domino Server present for importing DXL files to NSF? No, there is no need to have Domino server installed on your machine. Without any server dependency, it is possible to perform the conversion from DXL files to NSF. What if I am not having expertise-level knowledge of Lotus Notes email client? Will I still be able to work with your utility? Yes, of course, you will be able to work with our DXL file to NSF converter. Our developers understand the difficulties faced while performing the migration. Therefore, they offer a simple-to-use interface to import DXL emails to NSF database. Is there any solution to convert DXL file to NSF with attachments? Yes, our tool is the solution through which you can convert the DXL file with attachments. Without putting any extra efforts, you can import Lotus Domino XML file to NSF along with attachments. It takes a lot of time to accomplish this task within few minutes. "As an evaluation task, I was given a target to convert Domino DXL files to NSF database format. Sometimes while working, I used to hear about this utility from my colleagues. Therefore, firstly I thought of giving a chance to this software. In first chance only, the product proved itself useful for me and I used it to import DXL to NSF for my project completion. "Giving a review for this product is an honor for me! Since 4-5 months, I was googling for a perfect solution to convert DXL file to NSF and I encountered many tools. The problem with them was that they were not proving useful for me. But, when I accessed this tool, all my complains overcame and with the simplest manner, I exported Lotus Notes DXL file to NSF." "I must say that it is an amazing tool. 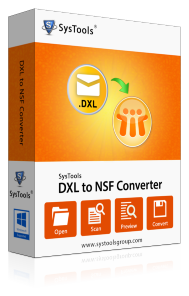 DXL to NSF Converter tool takes a very less time to convert all the data from Domino XML file to Lotus Notes NSF file without any data loss. I was able to complete the conversion of thousands of emails in few minutes. The tool really works smoothly and efficiently. Thanks for such utility!" "With the help of DXL file to NSF Converter tool, I was able to complete the task given by my boss. As I am new to Lotus Notes and Domino server, it was hard for me to complete the task. But this tool reduces my efforts and accomplish the task with so much ease. I was completely shocked with the effective working of the software. The FreeViewer team really deserves an appreciation when it comes to the production of this tool."